The Invacare Platinum 10 Oxygen Concentrator provides an attractive alternative to liquid systems and is known for reliability, performance and value. The unit features quiet operation, a top handle and bottom recesses for easy handling and a side filter access door. 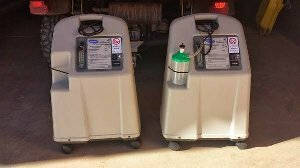 In addition, the concentrator is compatible with the Invacare® HomeFill® Oxygen System and is available with an Invacare® SensO2® Oxygen Purity Sensor.